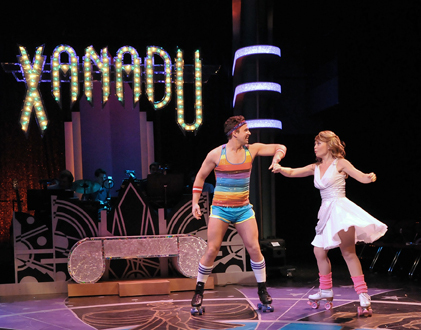 SpeakEasy Stage is ending the season on a roll -- on roller-skates, actually -- with a deliciously ditzy production of "Xanadu." Everything about this production is smart and witty. 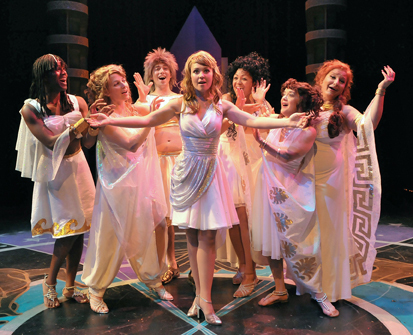 Douglas Carter Beane ("Little Dog Who Laughed," "As Bees In Honey Drown" and "Lysistrata Jones") has written an irresistibly funny book, linking songs from the flop Olivia Newton John cult film "Xanadu" into his new script. If you've seen anything written by Beane in the past, you know he's just the guy to make this all work. From camp to self referential humor, the story swirls like a dazzling disco ball. And with just about as much substance. The night is meant to be light, and that is it. Sonny Malone is a sidewalk artist, creating a chalk drawing depicting the Greek Muses. He needs inspiration, so the ladies suddenly descend from Mt. Olympus to provide just that. They may have thought they were heading to Venice, Italy, but this is Venice Beach. When on Earth, Muses must disguise themselves as mortal, so Clio the muse of history, takes on the name of Kira. And adopts an Australian accent. And the ability to roller-skate. She also takes a shine to Sonny. Muses are forbidden from falling in love with mortals, but that's exactly what happens thanks to the jealousy of Clio's sister Muses. With his new found confidence, Sonny (who's about as deep as a puddle) decides to open his own nightspot, called, appropriately enough, Xanadu. The fly in the ointment is that the abandoned, run-down facility is owned by the highly-successful and even more snarly Danny Maguire (who, by coincidence, was once inspired by Kira in another form). But if Sonny can totally renovate the club by 5 o'clock, it's a deal. Make sense? It doesn't have to. It's all silly fun, filled with sight gags and anchored by several engaging performances. And of course there's the music by Jeff Lynne and John Farrar which has long been part of our musical landscape. "Suddenly," "All Over The World," "Have You never Been Mellow," "I'm Alive," "Don't Walk Away" and more. As Kira, McCaela Donovan (no relation) makes every entrance in a hastily thrown fistful of glitter. As always, McCaela sings great and adds her own unique, comic charm to the tongue-firmly-in-cheek proceedings. Ryan Overberg (at left with Donovan) makes his SpeakEasy debut as the hunky Sonny with a performance that's so down to earth and simple that you almost forget how much effort it actually takes to make it appear that easy. Robert Saoud has a chance to double as both Danny Maguire and Zeus, adding his usual panache to each. The Muses -- Cleo Bourne, Patrick Connolly, Shana Dirik, Kami Russell Smith, Val Sullivan and Kathy St. George (chewing the scenery like never before) -- are a comically irreverent lot, sitting with the audience for part of the show, adding commentary and moving the plot along. And really -- how can you not fall for a show that zings everything from Cinderella and Andrew Lloyd Webber to actors doubling. Plus, it's got a wind effect courtesy of a straight-faced stagehand who hovers in front of the star with an electric fan. For this production, SpeakEasy's 100th by the way, seating at the Roberts Studio Theatre at the Calderwood has been reconfigured to place the audience on three sides of the playing area. It makes the setting seem very much like a club, which only adds to the experience. The band -- all excellent and totally into the spirit of things under the direction of Nicholas James Carroll -- is positioned at the far end. Paul Daigneault directs with just the right touch of serious silliness. Choreographer David Connolly keeps the wheels spinning. And special note to Crystal Tiala for the clever flying horse. Just when you think the proceedings couldn't go any more over the top, the finale adds a centaur, a cyclops and Medusa herself -- who the rest of the cast can't bear to look at, for obvious reasons. Then the audience is pulled on stage to dance. 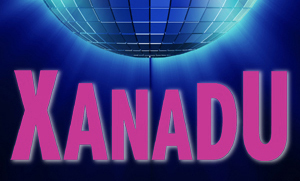 "Xanadu" from SpeakEasy Stage, is at the Calderwood Pavilion through June 9. For information, call 617-933-8600.